making a difference in countless lives. Working among the people who live along the riverbanks of Bangladesh, called “char dwellers”, Friendship runs three floating hospitals that provide medical care for a vulnerable and marginalised section of the population. 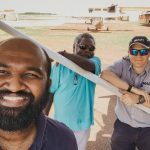 MAF serves Friendship by regularly flying in volunteer international doctors and supplies. The Lifebuoy Friendship Hospital was initiated by Friendship in 2001 with an aim to provide essential healthcare services to the char (river island) populace. Following its unparalleled success at serving these communities, the Emirates Friendship Hospital was also introduced in 2008.The third floating Hospital Rongdhonu Friendship Hospital has started its operation from 2013. All three ships are suitably equipped to provide primary and secondary care to its patients. The hospitals are also fully mobile and relocate every few months to provide the health care service. MAF serves Tdh by regularly flying technical staff to the remote Patharghata Union in Barguna District. 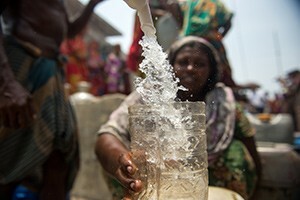 Tdh works with over seven thousand families living in cyclone-prone coastal villages in Bangladesh. 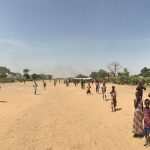 These families endure a lack of basic services and dismal conditions, which lead to high risk pregnancies, acute malnutrition and other trials. Tdh improves the nutritional status of children aged between 6 months and 5 years old suffering from moderate to acute malnutrition, and for malnourished pregnant and lactating women living in Kurigram and Barguna districts. The project mobilizes communities by organizing group discussions, cooking demonstrations and campaigns to raise awareness on health, nutrition and hygiene. Tdh also provides feedings as dry take-home rations and routine basic treatments for children and women with moderate or acute malnutrition. As diversification of food is crucial for fighting against malnutrition, Tdh helps women to construct homestead gardens. The innovative design is built in a circle, raised off the ground to prevent damage by flooding with a compost unit in the middle, allowing them to have fresh and diversified vegetables all year-round. 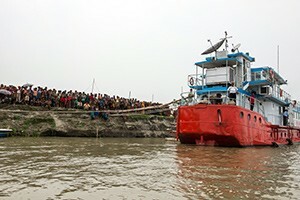 During the worst of times, the Satkhira community was forced to travel 30-40 km by boat to collect safe water. Now they are able to collect and manage clean water from their own community. In 14 hours, the plant can produce 5000 litres of clean drinking water. The WaterAid project at Satkhira includes the set-up and training of a Disaster Management Committee made up of about 25 people. The committee also manages the Reverse Osmosis water plant with the help of WaterAid who provided technical training. The committee manages the costs of set-up, water bills, caretaker wages, and maintenance. WaterAid also provides latrine sanitation and hygiene training to schools in the community.